Sharda´s sire is my beloved Ganges and she is the last foal of my dear Salaterka. Sharda´s sire Ganges was himself a Stakes-winner and a performance winner in the US. He was also 2000 Scandinavian Open Champion Stallion and Best in Show, 2001 Polish National Champion Stallion, 2001 All Nations Cup Reserve Champion and 2003 US National Reserve Champion Stallion. stallions Etiw, Etan, Etap, Eternit and Etnograf as well as the mares Etruria – World, European and Polish Champion Mare and Equitana – Polish National Junior Champion Mare. 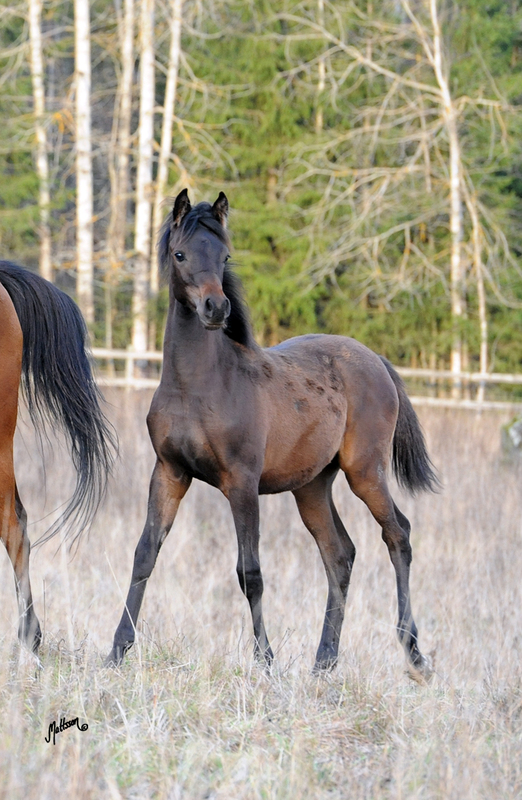 Salaterka´s dam Sapala (Cadyk x Saldara) was bred by Beit El Kheil Arabians and I chose her to be my foundation mare. Saldara has been a great producer of 10 fillies and 3 colts including Swedish National Junior Champion Filly Saleta and Swedish National Reserve Junior Champion Colt Sargasso.